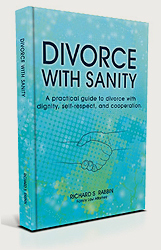 Title - Divorce with Sanity : A practical guide to divorce with dignity, self-respect, and cooperation. Available Formats - Paperback, Ebook and Kindle. Product Description - The sad and tragic truth in the U. S. is that more than 50% of all first marriages end in divorce. Most divorces occur within the existing litigated court process, wherein the divorcing parties are almost required by the very nature of the adversarial process to become antagonistic to each other, waste time and money, and treat children as pawns in their power struggle. The physical, emotional, psychological, and financial costs of litigated divorce can be enormous. Now, there is another way: Divorce with Sanity. Richard S Rabbin, a respected Family Law Attorney who has handled countless divorce cases during the past three decades, has written a book that provides people seeking divorce with an entirely different approach to the divorce process. People can separate with dignity, self-respect, and cooperation. They now have the tools to escape the adversarial divorce process and create their own divorce rather than allowing the court to do it for them. 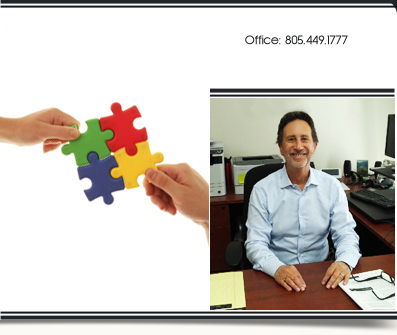 About the Author - Rick Rabbin is currently a family law practitioner in Ventura County, California. He has previously practiced law in several other counties in California and operated a mediation business in Portland, Oregon. While in Oregon, he worked with a State Assembly woman to introduce legislation that created a Task Force that revised Oregon divorce laws to make them more equitable. He offers experienced representation and expertise in the area of Family Law. He also handles mediation cases and collaborative law divorce cases. He is past president of the Ventura County Family Law Bar Association. A graduate of the Pepperdine School of Law and member of the California Bar Association since 1974, Mr. Rabbin has been in practice over 35 years. Whether representing a client in court, mediating on his or her behalf, or offering family law advice on an hourly basis, Mr. Rabbin’s client relationship is distinguished by his careful listening to the client’s desires and goals; he always takes the time to fully include the client in all solution strategies. This book is derived from the many hours spent with clients in his offi ce, in the courtroom and with judges and other attorneys in litigating and resolving family law cases. Purchase your copy online now! Purchase your copy online now through PayPal (worldwide). Note: You will be directed to the RSRABBIN PayPal account to make payment. IMPORTANT DOWNLOAD INFORMATION: After payment is complete you will be re-directed back to this site. Please ensure you allow this re-direction as it will supply you with your access codes for the product you have just purchased. Policy: All sales are final and refunds are not given. You can purchase the paperback version via various online bookstores throughout the world. Prices vay. Cover to Introduction (11 pages).